I must admit, I’ve always loved lasagna. 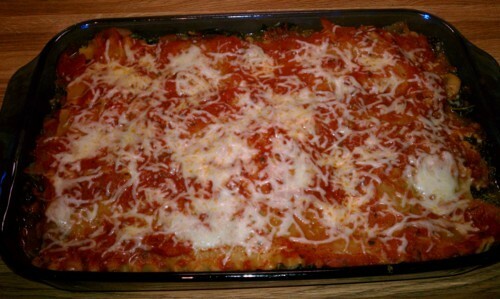 However, I really only love lasagna in the style that my mom makes because I don’t like ricotta cheese. That’s why I never order it at a restaurant. 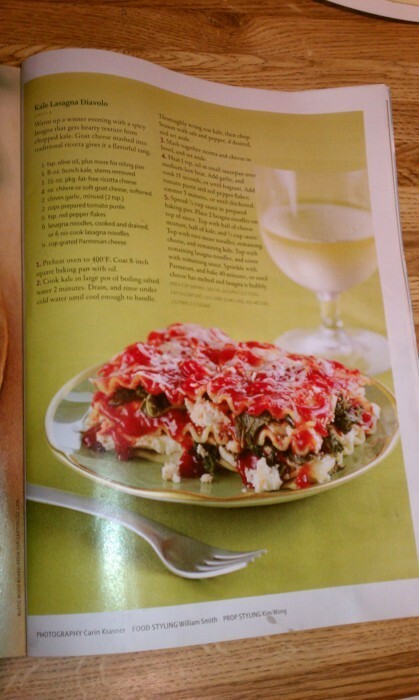 For this week’s dinner I decided to adapt a Kale Lasagna Diavolo recipe from my January / February 2011 issue of Vegetarian Times magazine since kale is in season and gorgeous (not to mention delicious) this time of year. The recipe didn’t have nearly enough vegetables in it for my liking, so I added mushrooms and onions. To make the lasagna more to my taste, I used small curd cottage cheese instead of ricotta cheese (my mom’s style) and an Italian Mix of cheese instead of goat cheese (local varieties are not really available this time of year). Instead of tomato paste I used a combination of canned tomatoes and pasta sauce. This was also the first time I’ve ever made lasagna with actual lasagna noodles. Mom always uses rigatoni noodles since they are way easier to deal with. Using lasagna noodles wasn’t as bad as I expected. Spread some cottage cheese and shredded cheese. 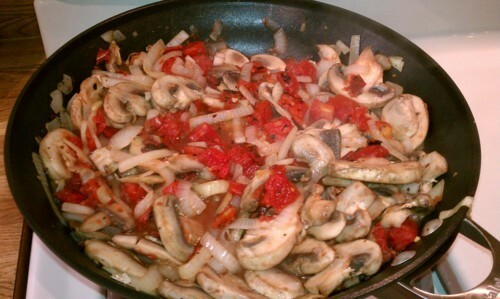 Put down half of the kale and half of the mushroom/onion/tomato mixture. Spread some more spaghetti sauce. 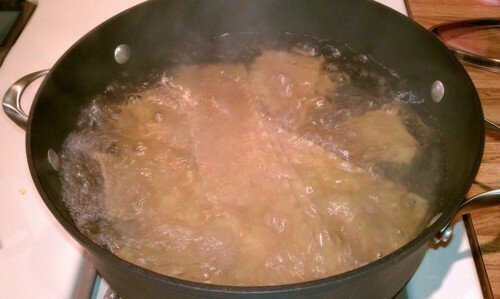 Lay down 3 more noodles. Lay down more cheese. Use up the rest of the kale and mushroom/onion/tomato mixture (lesson learned: don’t use all the liquid from that mixture). Spread spaghetti sauce. Lay down the last 3 noodles. spread a thin layer of spaghetti sauce. Cover with foil, bake for 40 minutes at 400 degrees. About 5 minutes from the end, sprinkle more shredded cheese on top if you like. I’d show you a picture of a slice of lasagna, but it ended up with lots of liquid and kind of went everywhere on the plate. Despite that I think this was the best lasagna I’ve ever made. 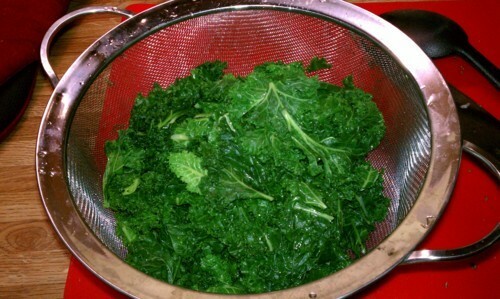 The kale has a great texture and all the flavors came together wonderfully. And on top of that, it’s incredibly healthy and low in calories! The recipe quotes 180 per serving but as I’ve adapted it, who knows where it stands.